We know, it's a rough morning after a late night out. Luckily, as a public service to the hungover, every week we track down the best bartenders in America and ask them to share their favorite hair-of-the-dog remedies. This week, a vitamin-packed mezcal cocktail crafted not by a barkeep, but by a man of science. THE SPECIALIST: In 2012, biochemist Alex Ott published Dr. Cocktail: 50 Spirited Infusions to Stimulate the Mind and Body. Not long before that he helped launch Mercy, a natural "hangover prevention" drink sold in Whole Foods that is funded by Gwyneth Paltrow, among others. His newest cocktail menu graces the three bars at New York's Refinery Hotel. 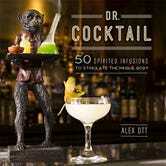 ITS ORIGINS: Alex Ott would like to be clear: "I'm not a mixologist. I'm a biochemist who happens to make drinks," he says. His vitamin-infused drinks are designed for hangover prevention and treatment. To understand why, you'll need an anatomy lesson. According to Ott, your body metabolizes alcohol into two components: ethanol, "the fun stuff," and acetaldehyde, a poisonous carcinogen. "A hangover is a depletion of nutrients, vitamins and minerals in your body, and acetaldehyde is the main culprit that contributes to that," he says. To rebalance your levels and cure the headache and nausea, you need to remove the carcinogen from your body. "Glutathione is your body's strongest detoxifying agent. In order to boost your glutathione levels, you need to ingest lots of Vitamin B1." Vitamin C, a powerful antioxidant, also helps your body neutralize liver damage. And don't worry, you can drink your morning vitamins with alcohol and the vitamins' potency won't suffer. "Alcohol is in everything. It's in cherries and bananas and strawberries," he says. "If you only ingest one ounce a day, alcohol is healthy for you. It improves and accelerates your cognitive function." IT'S HEALING POWERS: Ott, who with long blonde hair and a denim jacket looks more like an artist than a chemist, operates his own private "flavor lab" out of his studio in Times Square. There he perfects flavor and scent combinations for cocktails and other products to promote homeopathic, natural healing. "I design cocktails like edible fragrances," he says. "The olfactory bulb controls your neurotransmitters, and I can use a smell to make you feel a certain way." For example, the scent of jasmine triggers your brain to release chemicals that will make you feel happier. So a jasmine cocktail, in theory, will make you cheerful. "I use the extracts, bioflavonoids, polyphenols and essential oils that are in my cocktails, because I know the biochemistry behind them." The Struggle Buggy includes pineapple and tamarind juices, which both add shots of vitamins B1 and C to your system and replenishes your potassium. Honey, a natural stimulator, wakes you up and assists in the production of that sweet, sweet glutathione. Ott was inspired to make this cocktail while drinking mezcal at a bar in Mexico. As he sipped the smoky tequila, he got a whiff of someone else's shot of Sambuca, an anise-flavored liqueur. The smell—and thus, the flavor—combination delighted him. "This is one of the best tequila cocktails I've ever come up with." IF YOU HAD LISTENED TO OTT IN THE FIRST PLACE, YOU WOULDN'T NEED THE STRUGGLE BUGGY: Ott designs his drinks so that people can drink 10—yes, 10—in a night and still feel fine the next day. How? 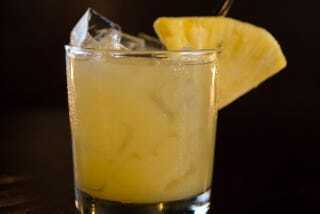 He packs his cocktails with vitamin-rich ingredients such as bananas, tamarind, pineapple and melon juices. "These are healing substance for your insides and organs," he says. "They have a lot of Vitamin B1 and C." His methods are so popular that actress Susan Sarandon has asked him to create a homeopathic cocktail menu for her bar, SPiN. THE METHOD: Combine all ingredients in a shaker filled with ice. Shake vigorously. Strain into ice-filled tumbler. Garnish with a pineapple wedge and lime wheel.